Like art, science expands our notion of the universe. It broadens our rainbow, lending us infrared or X-ray vision. It takes us from microcosms to the cosmos. It lets us envision how our planet was born, and how it might eventually die. No wonder, then, that science can beget compelling art — which is what Argonne National Laboratory’s annual ​“Art of Science” contest is all about. The contest calls for laboratory employees and users of Argonne’s facilities to submit images and photographs that showcase their research. Art of Science images provide vivid and enchanting representations of the world-class research that scientists and engineers engage in daily on Argonne’s grounds. Submissions range from protein structures to computer simulations to images from the microscope. Images from the contest grace the pages of Argonne publications, adorn laboratory buildings and share cutting-edge research with audiences outside the laboratory through traveling exhibits. They have appeared in public-access libraries, including the University of Chicago​’s John Crerar Library and the Downers Grove Public Library. 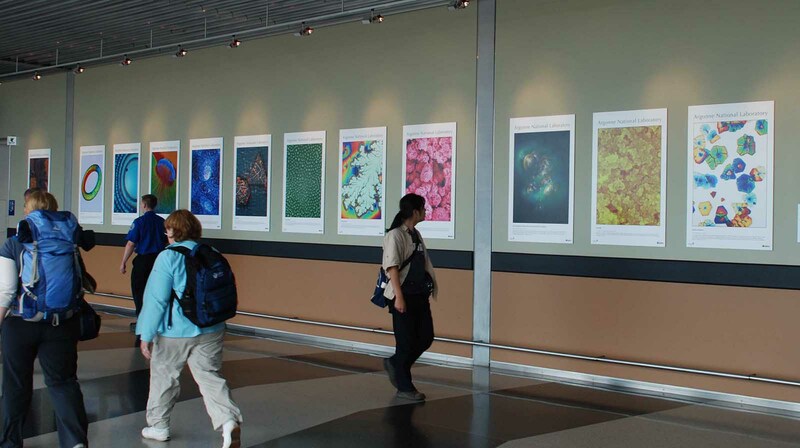 Most recently, 27 Art of Science posters were installed in an exhibit at O’Hare International Airport in Chicago. The O’Hare exhibit, which is now up and will run through early 2013, is located in the hallways connecting Terminals 2 and 3 adjacent to the Rotunda. In addition to sharing Argonne’s dedication to scientific discovery, Art of Science reminds us of the power of coupling art and science. By commingling the two, scientists and artists can expand the scope of their work in impressive ways. Art of Science is the perfect outlet for the scientist who, in the pursuit of knowledge, has stumbled across something sublime. The results can resonate with people who don’t necessarily envision electrons, blood platelets or nanomaterials on a daily basis. This fall, Argonne will continue its Art of Science tradition with the laboratory’s fourth annual contest. To see images from previous contests, visit Argonne’s Flickr site. This Art of Science image is a scanning electron micrograph of polyether sulfone polymer cast by solvent evaporation on the surface of a metallic lithium electrode. Image by Carmen M. López.